Many of the props we have in the game zones (or ‘maps’) at Delta Force Paintball centres across the globe feature real tanks, armoured cars, artillery pieces, rockets and rocket-launchers, planes, helicopters, cars, trucks, and even double-decker-buses – but we also custom-make our own set-pieces. Sometimes these custom-made pieces are actually even better than the real thing as we can squeeze them into otherwise inaccessible places on our movie-set quality game zones in our woodlands – and they are built with paintball-playing in mind. 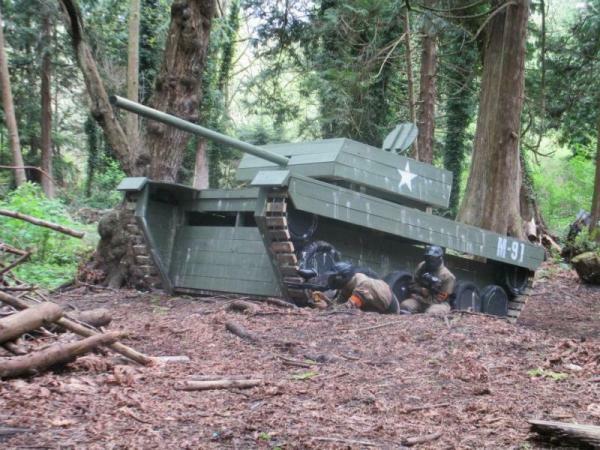 Take the tanks at Delta Force Paintball in Orpington, Kent for example – these puppies can take up to 8 paintball gun-toting players inside their super-structures – and those players can fire out at the enemy through purpose-made gun-slots. When battle gets underway, everyone’s paintball guns are blazing and the air is filled with smoke from all the grenades that have been let-off – there’s only one word to describe it – mayhem! Paintball was always great fun – but it’s been taken to new heights with all this extra showmanship. When you come paintballing at Delta Force it’s not just paintball – it’s so much more!